Our last edition defined CMT (Cumulative Microtrauma) the cause of most physical discomfort attendant to sitting and working on a computer. You may feel CMT on your body as fatigue, discomfort, or pain. The pandemic existence of CMT among office workers around the world affects moods, joint function, production and well-being. 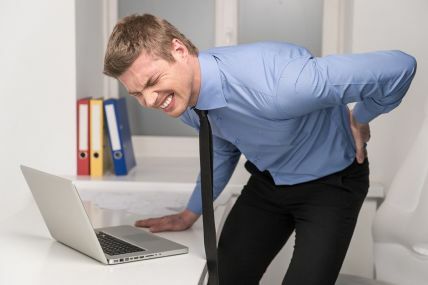 Employers, not aware of CMT as the source of employee "ergonomic" complaints, are compelled to purchase new ergonomic furniture, equipment and gadgets that in many cases don't completely solve the employee's condition. The basic fundamental of problem solving is to determine the exact cause, as eliminating the exact cause of any problem eliminates the problem. A prevalent issue with most office workers or executives in today's high tech world is CMT, as a result of computer and cell phone related repetitive activities. The solution is to prevent CMT. Most offices are already equipped with furniture that can be adjusted adequately to position 95% of human beings properly. Yet close to 100% (actual fact) of the people that work in offices sit and work at their computer incorrectly!! FIT's Sittingsafe® program teaches the "Laws of Sitting" which are almost completely unknown by our society. Not knowing these very simple laws predisposes us to CMT and the gamut of physical symptoms. Our first edition described maintaining "open angles." I trust that has been helpful. Today I want to mention "neutral head posture." Your monitor's position—height and distance from your eyes—dictates the position of your head. If you are experiencing neck and shoulder pain, this will help (as will the next edition… stay tuned!). Your head weighs 10-12 pounds when you maintain a neutral posture; that is, when your head is in its natural position while looking straight ahead in a relaxed state. However, your 12 pound head can have the effect of weighing over 30 pounds (!) when you slouch and "turtle" your head out towards your monitor while looking at your screen. This is called "forward head posture" and is very insidious. Many people, as a result of this chronic posture, have their heads and neck fixed in this position permanently causing continual stress on their neck and shoulders. 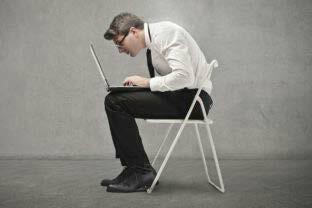 Not only does "forward head posture" cause neck and shoulder discomfort but it also reduces your oxygen intake. Sit up straight with your head in neutral posture and while noticing your air intake, take 2 nice deep breaths. Now jut your chin out as if looking at your monitor incorrectly (forward head posture) and try taking 2 deep breaths—you can't do it, right?! "Forward head posture" contributes to neck and shoulder pain and discomfort, headaches, and your ability to breathe normally. SOLUTION to prevent "forward head posture": Move your monitor closer to you or increase the font size to prevent the urge to be closer to your monitor. FIT offers on-site group Sittingsafe workshops anywhere in the country. We teach people how to set up their existing workstations and a very powerful stretching routine specific for office workers. We also conduct one-on-one ergonomic evaluations. Visit our website at www.backsafe.com for more information on Sittingsafe and our industrial lifting program Backsafe®. Until next time, remember Open Angles and Neutral Head Posture! You'll feel better, I promise!